I teach a musical, fluid vinyasa. I encourage my yogis to explore consciousness through the energetic cues of the subtle body and anatomical awareness. My classes are an experience into your self, to take notice of the energetic scintillation, to feel the guttural driving emotion, and to integrate energy and emotion with the body and mind. It's a practice of gratitude for self, balancing acceptance with non-attachment, and finding peace and beauty in all things through movement. 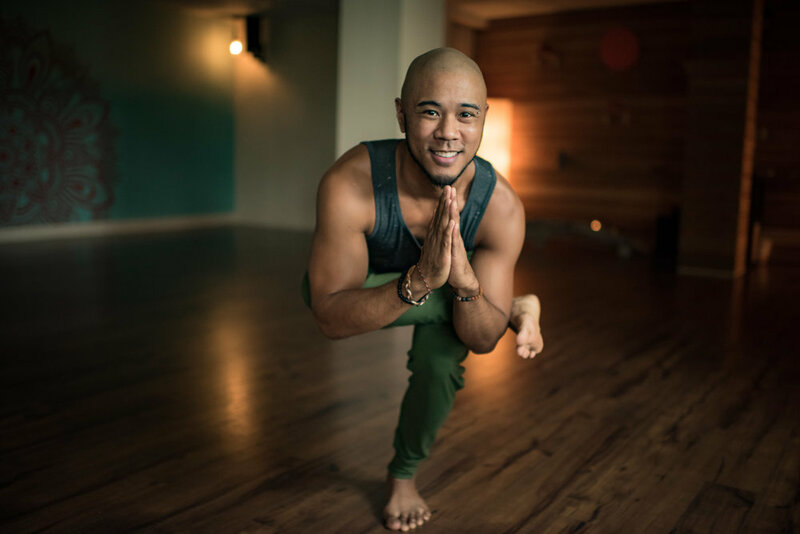 My classes are super playful and explorative, and I look to expand the barriers of thought and physicality through utilization of the energetic breath and sentient body mindfulness. In other words, my classes are fun and push your paradigms for a deep exploration of your yogic expression. Beyond the mat, I am an entrepreneur. I am a designer. I am a renaissance man. I am weirdly good at a lot of random things—like the Japanese art of decluttering, community building, party planning, cooking, leadership, and barbering. The Loves of my life are my two, ever-brilliant teenage beauties, Naleisha and Malia and our chuga chuga (Chihuahua/Pug) Roxy. But also, I am husband to the inspirational and fiercely compassionate wild woman, Adrienne Kimberley Rabena!